Pumpkin season is my most favorite time of year. I don't really get into the pumpkin flavored all the things, but I sure do love a cute little gourd (or 5 or 6) sitting on my doorstep. And fabric pumpkins on a shelf are just as good! With this little tutorial, and fabric bundle from my shop, you can make your own collection of 5 or 6, and there is no sewing machine required. 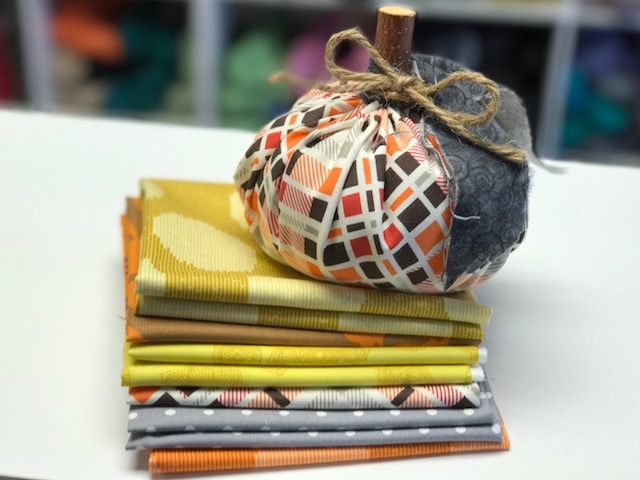 For starters, here is the link to the fabric bundle: Fall Fat Quarter Bundle from Daisy Lane Design. In it you will find 6 designer quality fabrics from Free Spirit Fabrics including Tula Pink, Amy Butler and Denyse Schmidt. Circle(s) to trace. The larger plaid pumpkin I made with a 13" diameter circle. The smaller, gray one was made with a 11" circle. Find some plates or platters to trace. A variety of circles will give you a variety of finished pumpkin sizes. 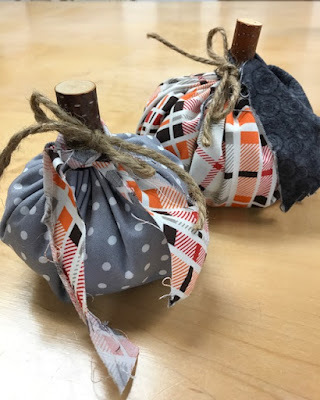 Twigs or a cinnamon stick, scraps of fabric, some jute or raffia for embellishing. Trace a circle onto the wrong side of one of the fall fabrics and cut out along the line. Step 2: Thread a hand-sewing needle with a length of thread and tie a knot in the end of the thread. Then, pinching down about 1/4 inch of the edge of the circle, push the needle through from the wrong side to the right side of the fabric. Step 3: Continue to pinch down 1/4" from the edge of the circle, and weave the needle and thread back and forth in 1/2" intervals, creating a running stitch that you can gather. Step 4: As the needle gets full of stitches, pull them through and off the needle, continuing around the circle until you reach the spot where you started. Your circle will look like a shower cap. Leave the needle and thread attached to your pumpkin for the next few steps. Step 5: Place a couple of handfuls of rice into the bottom of the shower cap, er, pumpkin. The amount will vary depending on the size pumpkin you are making. You can pick the pouch of fabric up and place it in your palm to see if the weight feels satisfying. That's how I know there's enough rice. Step 6: Place some fiberfill on top of the rice. The more fiberfill you use, the plumper your pumpkin will be. Less fill will produce a floppier pumpkin. The desired end result is up to you! Step 7: Pull the needle and the stitching will cinch up, leaving a small hole for the twig or cinnamon stick. This is a store-bought crafty stick but you can use driftwood or twigs from your backyard too. You can always adjust the amount of rice or fiberfill at this point so that your pumpkin looks and feels just as you wish before finishing up. Step 8: Once satisfied with the little guy, tie a knot or two in the thread and cut the excess. 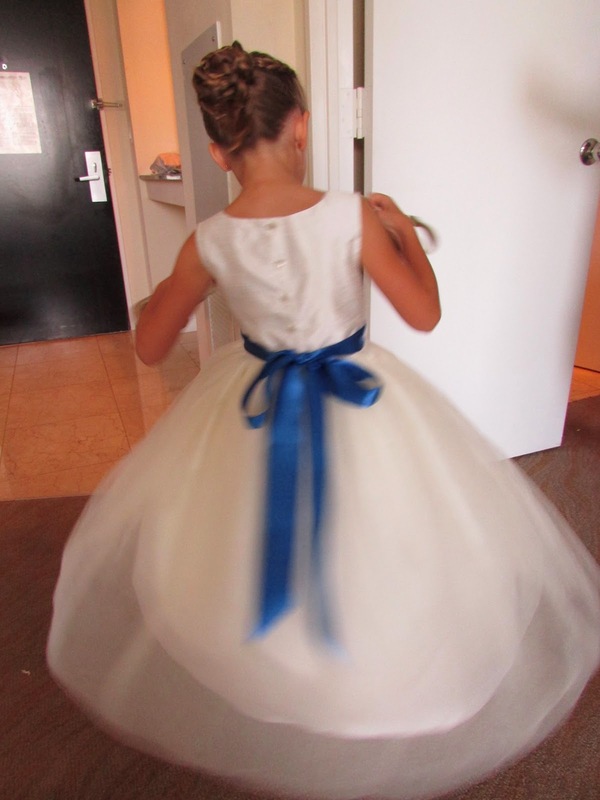 Sometimes it's a little tricky keeping the thread taut and tying the knot. Having an extra set of hands is nice. But don't worry, if you have some pucker. Just tack a few drops of hot glue around the stick, down below the fabric line, and press. That will take care of any gaps. Step 9: Embellish as desired. Scraps of fabric, jute, raffia, a leaf or two...whatever you like! These would be super cute place markers for Thanksgiving - you could add a name tag and tie that on as well. If you decide to make some of these little guys, I'd love to see them. Tag @daisylanedesign on Instagram.